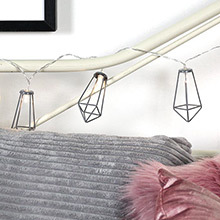 Bedroom fairy lights are perfect for headboards, mirrors, hanging from ceilings or off walls. 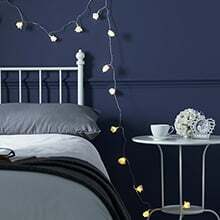 Give your bedroom the fairy lights treatment with mains or battery powered fairy lights, ideal for illuminating any bedroom, whether it be home, university or on the move. With a huge variety to choose from, Festive Lights are proud to offer all colours, shapes and sizes. On trend, versatile, decorative curtain light. 20 strings of delicate copper wire lights. On trend rose gold colour. Very high quality & attention to detail. They often say that the bedroom is 'where the magic happens' or at least that's what they said on MTV Cribs back in the 90s and early 2000s. The magic can't truly happen though without some delightful bedroom fairy lights to add a bit of sparkle to an otherwise bland bedroom. 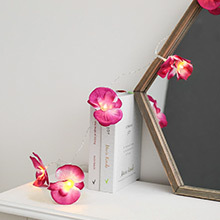 Our customers often choose to wrap these around headboards or mirrors, but other ideas are to attach post it notes or polaroid pictures to your fairy lights for a unique display feature, or to create interesting shapes or designs with your lights. 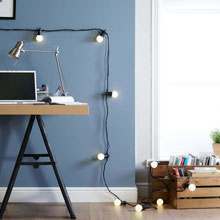 Battery fairy lights create ambient mood lighting for a relaxing evening in when the main light is just too harsh. Helping you unwind with the graceful twinkling of lights just like the stars at night in the comfort of your own bedroom. Many of our battery fairy lights come with a timer function, so they will switch themselves off after they have helped you drift off to sleep. We stock a range of accessories for fairy lights, including a selection of hooks for hanging the lights.